Day 3 and 4: I LOVE Weed!!! Dude, I LOVE Weed! Yeah, Weed. Its green, smells good, is pretty and it's gets you high. But bro, we aint talking about that kinda weed. There's none of that puff puff pass stuff going on here. I'm talking about Weed, California! Since I'm a day behind, let's back up. 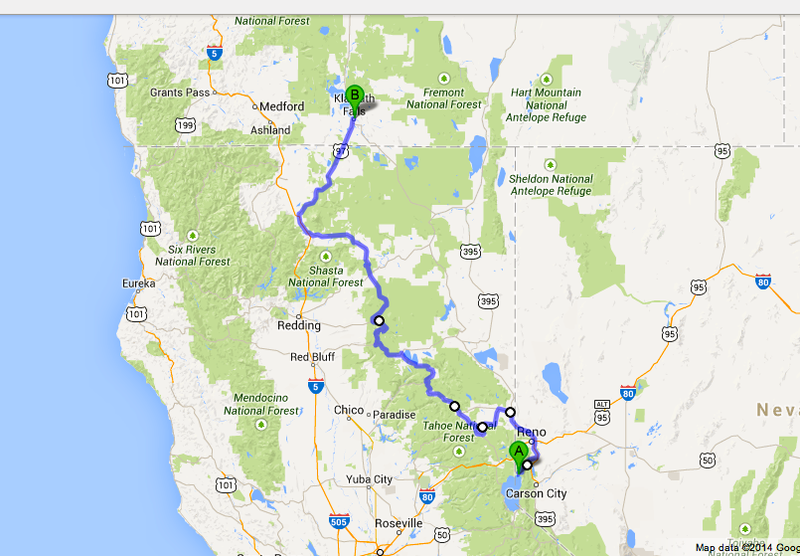 We jetted from Tahoe the other day and since I screwed up the route, I made Amanda ride an extra....30 miles. Ok, I lied....40 miles. Ok, so I reallly screwed up. We rode 411 miles when I told her we really only had to do 200 some. It must be my good looks that she keeps me around for! Here's our route from Day 3. We left Tahoe and headed up Mt Rose. The views were great! Honestly, while today was on the longer side, the roads were spectacular. Thanks to my sister who let me high jack her Spotify account, otherwise I would have had to listen to Amanda talk to me on the intercom all day (just kidding hunny!). I felt like we were in the middle of nowhere on this route, sometimes not passing a car for 20-40 miles at a clip. There were lots of twisties and also lots of straight aways. The bike continues to perform flawlessly. The power is great on the Multistrada 1200 and the new spring put on at Evolution in Santa Clara is making the ride a pleasure. It was a warm one today. Between the Reno, NV area and some of the back roads on the way to Weed, the temps got in the 80's. Ok Ok, so maybe 80 isn't that hot, but when you live in San Francisco, 80 means it's probably too hot to take my pastey body outside. Thank god my moto jacket doubles as a belly shirt, otherwise I would have been overheating! Today we were going to meet Rick (you remember rick, the funny lookin dude with the different color beard) in Weed. At an elevation of 3,425ft above sea level, it is HIGHer than where I am used to in San Francisco. The trees and fields are GREEN and we drove through this one section that smelled like amazing. Oh wait, maybe that was when I passed gas. Yep, it was when I farted. We checked into the Maverick Motel in Klamath Falls. 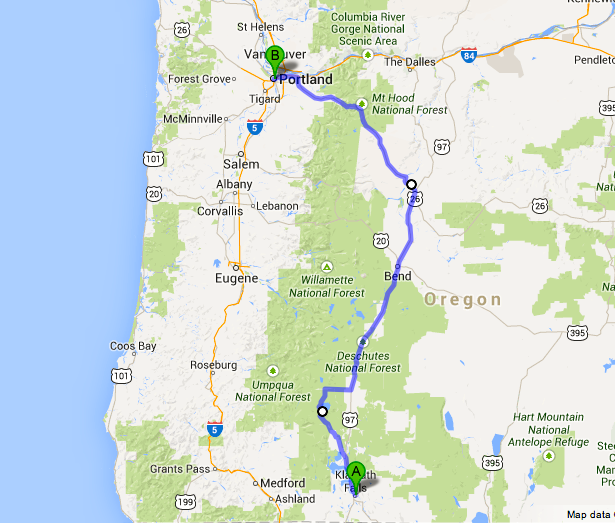 This would set us up for day 4 which would route from Klamath Falls to Crater Lake and finish in Portland. We crushed some beers and fried oysters next to the motel and then hit the sack. Here's a couple randos from Day 3. OK, MOVING ALONG....let's talk about today. With Rick now latched on, not only did the pace pick up, but we had to look at this first thing in the morning. Here's the route for Day 4 (today). 358-ish miles. Today started off with some Crater Lake. Amanda has never seen Crater Lake and I knew she'd be in for a treat. That place is amazing, if you've never been there, it's a must see. It's 1,943 ft deep! That's the deepest lake in the United States and the 9th deepest in the world. It's deep blue color reminds me of Lake Tahoe and it's vast size reminds me of the first time I stepped foot on the rim of the grand canyon. From Crater Lake, the ride was fairly uneventful. A deer almost running in the road, Rick giving the middle finger more, Amanda listening to her books on tape, and me jamming out to Justin Timberlake. 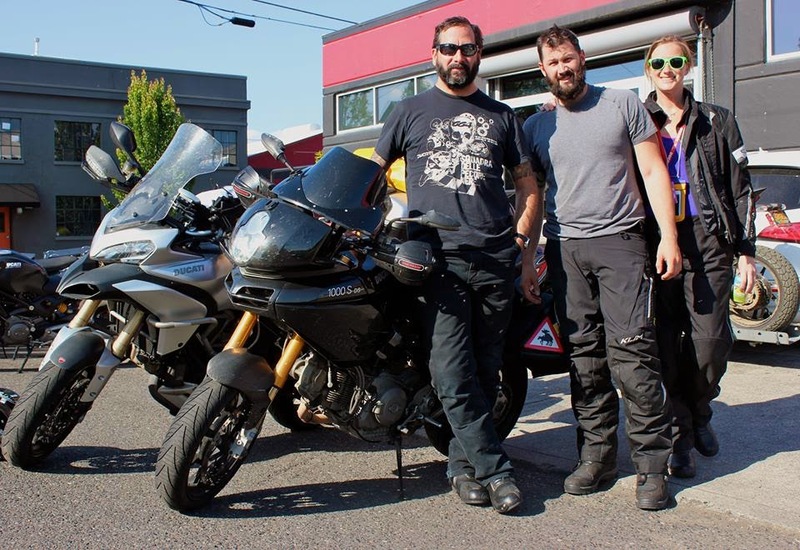 When we hit Portland, our first stop was Motocorsa. I had to get my front brake lever looked at and Rick had a bolt from his pannier rack rattle loose and needed some other accessories for Alaska. First let me say, this place is total eye candy. It's like a motorcycle wonderland inside. Ducatis EVERYWHERE. Ricks buddy A.J. came out immediately and helped me out with my brake lever which is perfect now. In addition, they came out to snap some pictures of us for their facebook page (https://www.facebook.com/MotoCorsa). I look like I need a shower so bad. And to shave. And a haircut. This was one of the dudes from Motocorsa snapping our pics. The night wound down at the house of an old grade school friend from back east. Every time I take a moto trip, I stay at Morgan's house in Portland. She and her husband Rick always are so welcoming and I owe them a super huge thank you in addition to the two "family style" pizzas and jar of cookie dough I whipped up tonight for all of us. Seeing familiar faces along this journey and even just chatting with people who ask where we are headed make this adventure even more fun. All of your blog comments and facebook comments are so encouraging. We are trying to share this adventure with everybody. It aint easy sitting on a motorcycle grinding twisties through national forests every day! Tomorrow we are headed to Seattle to stay with another friend. More blogging to come.